Portrait of William N. Nickerson, Jr. Image available on the Internet and included in accordance with Title 17 U.S.C. Section 107. The Founders of Golden State Mutual Life Insurance Company look at a model of their new building. Courtesy of UCLA Library Special Collections. Image available on the Internet and included in accordance with Title 17 U.S.C. Section 107. William N. Nickerson, Jr.'s Grave. Image available on the Internet and included in accordance with Title 17 U.S.C. Section 107. NICKERSON, WILLIAM N., JR. (1879–1945). William N. Nickerson, Jr., black businessman, was born in Louisiana on January 26, 1879, to William N. and Emma (Pool) Nickerson, Sr. The family moved from Louisiana to San Jacinto County, Texas, shortly after his birth. He attended Bishop College and graduated in 1904. After moving to Houston he worked as an insurance agent for the black division of the Southern Mutual Benefit Association. In 1916 Nickerson, Clifton F. Richardson, Sr., and several others began a newspaper, the Houston Observer. After Richardson, the manager and editor, resigned in 1919, Nickerson, Richardson, and H. F. Edwards organized the Informer Publishing Company to publish the Houston Informer. In Houston, Nickerson's efforts on behalf of black civil rights included an attempt in 1919 to overturn the state's white primary. During this time he and several others organized the American Mutual Benefit Association, the first black-owned insurance company in Texas. Nickerson, wishing to start an insurance company that would cover numerous states, left the successful American Mutual and moved to Los Angeles in July 1925. 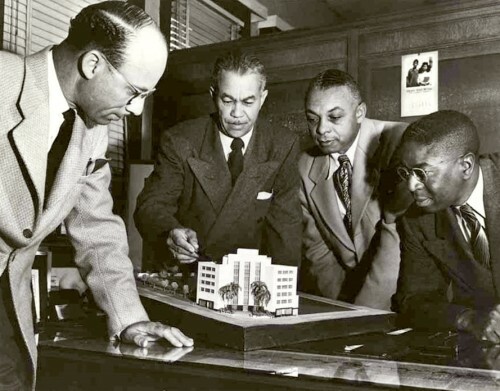 After spending $27.50 for books on California insurance law, he and another African American, Norman O. Houston, founded the Golden State Mutual Life Insurance Company. Nickerson sought to establish an integrated company; most insurance companies at that time were segregated. Besides selling insurance to any qualified buyer, Golden State had nondiscriminatory employment practices. Nickerson later expanded the company into twenty states, including Texas. Even though he later moved back to Houston, he continued to serve as chairman of the company until his death. He married Bertha Benton in 1906, and they had eight children. In 1938 Bishop College awarded Nickerson an honorary doctorate of science and business administration in recognition of his achievements. He died on November 14, 1945. By 1979 the company he founded had become the second largest black-owned business in the Western United States. Charles Downey, "Ordinary is Extraordinary for Golden State," Black Enterprise, June 1979. Charles William Grose, Black Newspapers in Texas, 1868–1970 (Ph.D. dissertation, University of Texas at Austin, 1972). Houston Informer, November 24, 1945. M. S. Stuart, An Economic Detour: A History of Insurance in the Lives of American Negroes (New York: Malliet, 1940). Handbook of Texas Online, Douglas Hales, "NICKERSON, WILLIAM N., JR.," accessed April 21, 2019, http://www.tshaonline.org/handbook/online/articles/fnifp.